In Desiring God, Piper says, ‘I found in myself an overwhelming longing to be happy, a tremendously powerful impulse to seek pleasure… it is unbiblical and arrogant to try to worship God for any other reason than the pleasure to be had in him’ (DG p18). Piper proposes that man’s greatest pleasure should be found in God. ‘The deepest and most enduring happiness is found only in God. Not from God, but in God’ (DG p28). ‘This fact—that praise means consummate pleasure and that the highest end of man is to drink deeply of this pleasure—was perhaps the most liberating discovery I ever made… The pleasure Christian Hedonism seeks is the pleasure that is in God Himself’ (Desiring God, p23,24). Piper again: ‘Between man and God, on the vertical axis of life, the pursuit of pleasure is not just tolerable: it is mandatory’ (DG p111). And: ‘The pursuit of pleasure is an essential motive for every good deed. If you aim to abandon the pursuit of full and lasting pleasure, you cannot love people or please God’ (DG p112). The term ‘hedonism’ is from the Greek word ἡδονή (hédoné) for pleasure. 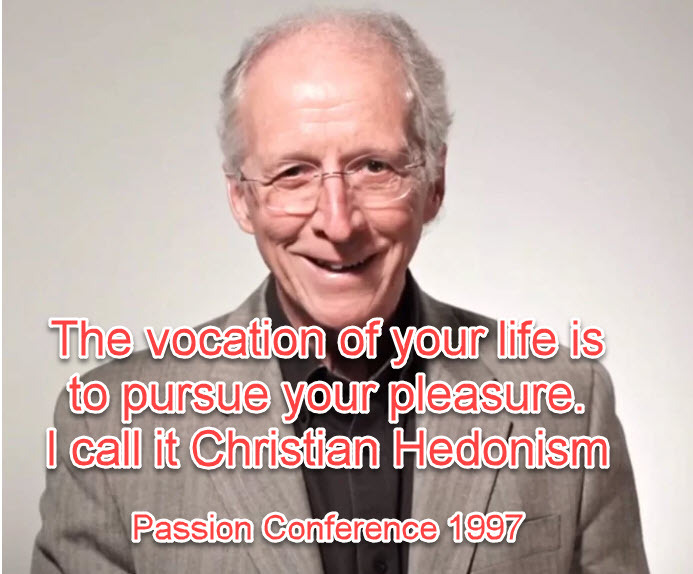 According to Vine’s Expository Dictionary of Old and New Testament Words, the word hédoné is used of the gratification of sinful desires. Strong’s Concordance says hédoné has a strong negative connotation, ‘generally referring to pleasure that is made an end in itself. That is, the satiation of bodily desires (lusts) at the expense of other things.’ The word occurs five times in New Testament, and each use has a negative connotation. ‘For we ourselves also were sometimes foolish, disobedient, deceived, serving divers lusts and pleasures, living in malice and envy, hateful, and hating one another’ (Titus 3.3). Apostle Peter uses hédoné to describe the pleasure of those who walk after the flesh in the lust of uncleanness. ‘And shall receive the reward of unrighteousness, as they that count it pleasure to riot in the day time. Spots they are and blemishes, sporting themselves with their own deceivings while they feast with you’ (2 Peter 2.13). 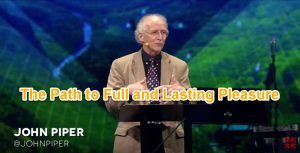 In the early 1980s John Piper created Christian Hedonism by joining together the humanistic philosophy of hedonism with the Christian Faith. The purpose of hedonism is to pursue a life of maximum pleasure; it cares nothing about truth. The purpose to the Christian life is to pursue holiness and righteousness, established and guided by the Holy Spirit of Truth. Piper’s Christian Hedonism is a heretical doctrine that has done a great disservice to the Church of the Lord, Jesus Christ. Piper sermon: SEPTEMBER 14, 2014, Join Me in Soul-Satisfaction in God, Village Church, Maple Plain, Minnesota, https://www.desiringgod.org/messages/join-me-in-soul-satisfaction-in-god.